In 1589 the Reverend William Lee of Calverton, near Nottingham, invented the stocking-frame. According to the Encyclopaedia Britannica, he did so because a local young woman was more interested in her knitting than him. He vowed to invent a machine that would make hand-knitting obsolete. The encyclopaedia says that the resulting technology "was so perfect in its conception that it continued to be the only mechanical means of knitting for hundreds of years." Certain historians, including Arnold Toynbee, have held that it was Lee's invention of the stocking frame - rather than the widespread use of steam power in the 18th century - that truly marked the beginning of the Industrial Revolution in Britain. The machine was also the target of some hostility from professional hand-knitters around the country. Most famously, in Leicester in 1779, a man called Ned Lud broke into a cottage and ("in a fit of insane rage," according to the Oxford English Dictionary) destroyed two stocking frames. Mr Lud unwittingly lent his name to the 18th century anarchist, anti-technology movement, the Luddites. In 1864, William Cotton of nearby Loughborough devised a way of knitting fabric so that it was automatically shaped as it was produced. 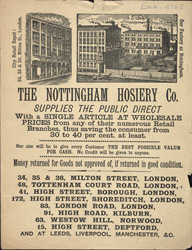 This invention revolutionised hosiery production again, and Nottingham became an important centre for the hosiery industry.